Seen mostly from commuter trains, I expect this castle is one of those landmarks that is just no longer noticed. A scheduled ancient monument, the castle had a lucky escape – not from French siege engines, but from those bringing a new prosperity to the Chilterns countryside. My straw pole revealed a distant lack of awareness too, when asked when was the last time they had visited Berkhamsted castle? Situated alongside the canal and railway in the busy market town of Berkhamsted in the northern Chilterns, the castle and it’s features seem only to emerge from the surrounding landscape if you look long and hard. The mound is covered in pretty spring flowers, the scene so benign. The elevated motte and keep, and if the badgers haven’t ripped up the turf looking for juicy earthworms, you could imagine the many wooden buildings inside a protective curtain, or bailey, offering protection to the occupants. This is where William the Conqueror received the submission of the English after the Battle of Hastings and it was his half-brother, Robert of Mortain, who built a timber castle around 1070. Built in the classic Norman motte-and-bailey style, with defensive conical mound and oval bailey below, the castle formed part of the Conquerors ‘ring of steel’ around the capital (along with Wallingford and Windsor Castles to the west, and the White Tower to the east), controlling trade routes and ensuring successful subjugation of the locals. The castle saw action in the Middle Ages; invasion by the French, civil war and in more settled times as royal residence, but slid into a slow decline of unsuitability and by default became unfashionable. The fortunes of Berkhamsted are closely linked to its castle which, when it waned and fell into disuse in the 15th century, stone was taken and reused to build houses and buildings in the town, greatly affected by this change in its status and prosperity. It was a long wait until the arrival of the inland waterways and railway in the 19th century before the locals enjoyed a revival. Now a scheduled ancient monument, protected by law, the castle had a lucky escape. Victorian railway designers sought to build the London to Birmingham Railway directly through the site, but was saved by strong local opposition. The Act of Parliament that authorised the construction of the railway also protected the castle making it the first such property to be protected by law. We have not always so proactive in protecting our heritage however, as landowners once believed they had the absolute right to destroy their properties and the notion the state could stop someone doing whatever they wanted to their own property was seen as ridiculous at the time. 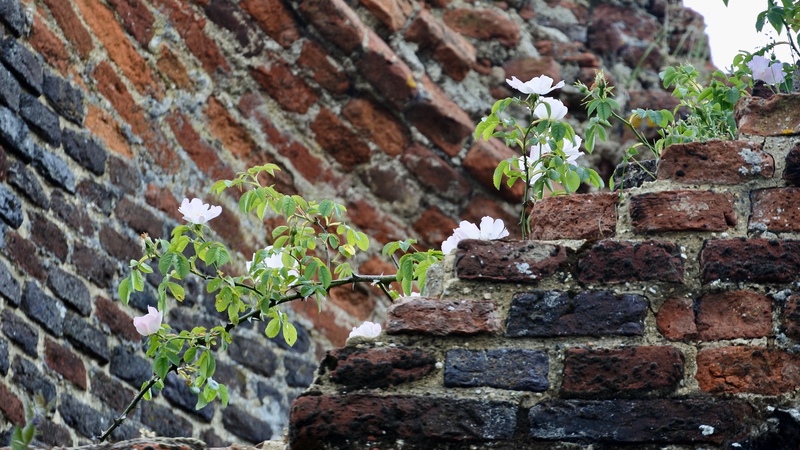 That Britain’s heritage was worth preserving was a belief held by weirdos, but thankfully for us, after witnessing so much mindless destruction, MP’s and heritage pioneers became determined to act. Incredible to even consider now the destruction of our heritage in the name of progress. Or in the case of spite, as was the story of the infamous Reverend Francis Gastrell, one-time owner of New Place, William Shakespeare’s final home in Stratford-upon-Avon. He bought the house in 1753 but “quickly got irritated with tourists wanting to see it”, says architectural historian Gavin Stamp. Gastrell was already in the town’s bad books after chopping down a mulberry tree planted by Shakespeare, then in an extraordinary fit of spite, demolished the house in 1759. It was never rebuilt and only the foundations remain. Suffice to say he was kicked out of town! 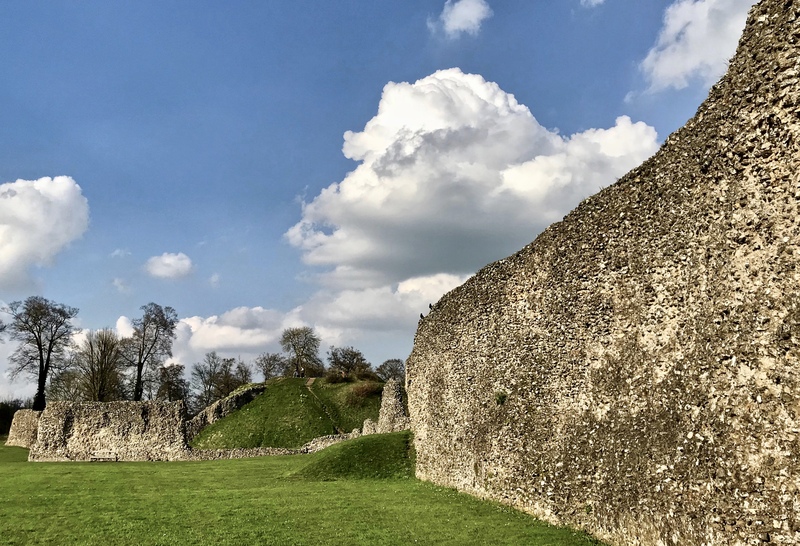 I think we need to reclaim and treasure our Chilterns’s castles; visit them, explore them, take a picnic, take your family to play dungeons and dragons, take your dog. Watch as they reflect the changing seasons through the windows of your train, and celebrate the spaces and possibilities those heritage weirdos have left for us. Admission is free to the site that is now managed by English Heritage. Read the astonishing story of a wild boy without a birth name, who was found in a German forest and adopted by a English king and came to live in nearby Northchurch. Our day began in the music room in what was the former home of Eric Gill, sculptor, typeface designer and printmaker who was closely associated with the Arts and Crafts movement. A day to discover what lies beneath, turned into an altogether unexpected musical encounter, as I headed out to spend a morning learning about the archeology that litters the floor of Pigotts Wood, an ancient Chilterns woodland. Near High Wycombe, Pigotts Woods is really tucked away in the Chiltern Hills, and if I hadn’t been in such a hurry to get to the course on time, would have found many distractions along the way to explore and photograph. The single lane wound its way up the hill with muntjac deer alongside the road which suddenly opens up into a sunny field with Pigotts up ahead. We assembled in the music room in what was the former home of Eric Gill, sculptor, typeface designer and printmaker who was closely associated with the Arts and Crafts movement. He designed one of the most famous British typefaces, Gill Sans, used in the classic design system of Penguin Books and by British Railways, with many additional styles created by Monotype both during and after Gill’s lifetime. Most famously perhaps as it was the typeface adopted by GNER for their flagship ‘Flying Scotsman’. Now home to the Wheeler Robinson family for over 50 years, it was they who began the tradition of amateur music weekends where young musicians could tackle not only the symphonies of Beethoven, but even mounting their own Ring cycle. Our host, Nick Robinson has continued this tradition and is a relaxed, affable man who was at one with his historic home. I liked him and loved his house; full of brick-a-brack and clutter, but I am sure each musical instrument, book and painting was there for a reason and not by casual design. I wonder how much the location influences the choices made and how each member performs on those weekends? 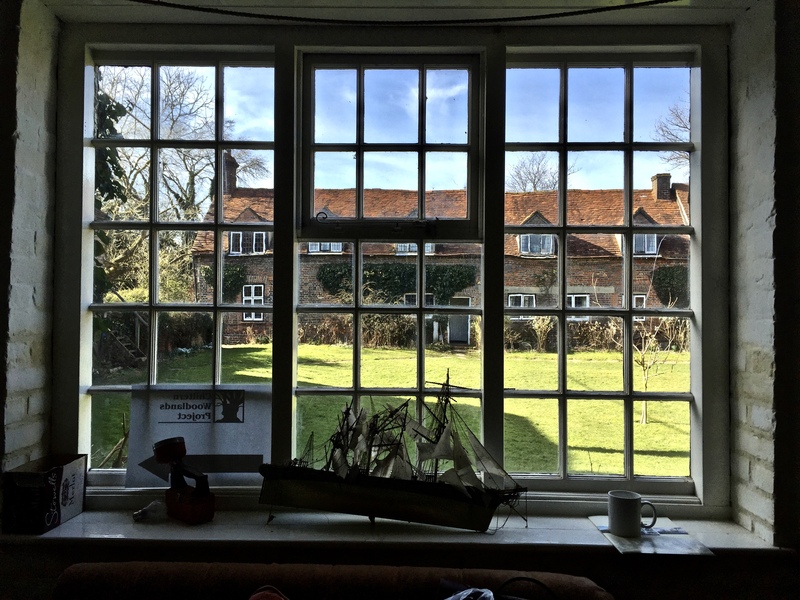 I could instantly tell that, set around a grassy, sunny courtyard the converted barns and pretty cottages are very much lived in, relaxed in and enjoyed. We helped ourselves to mugs of tea whilst Nick told us more about his amazing house and music tradition before John from the Chiltern Woodland Project lead us off into the woods. He was determined we would master the names of woodland flowers, recognise the manmade features – sometimes with their give-way mossy mantle, but to the untrained eye, largely unrecognisable; property boundaries, iron slag and sites where charcoal was once made, John also showed us a pillow mound – a rabbit warren for rabbit farming – and how to recognise a saw pit which are a special feature of the Chilterns woods and forests. I am especially interested in the stories associated with past trades and industry and in this case, once a heavy log had been placed over the pit and secured into place with a hook called a ‘dog’, the man who worked on top of the log was the top dog and the one beneath (having to do all the hard work I suspect), was the underdog. I was struck too, how once, absolutely everything had to be grown at home, farmed, or ingredients sourced and items made as there weren’t many middle-men or a B&Q to pop into to buy charcoal, a new shirt or the weekly groceries. If you weren’t making it yourself, in the main you got on without it. A day to discover what lies beneath the woodland floor, turned into more than just looking at the obvious plants and animals, it was a morning filled with stories, unexpected historical links and folklore, all from such an unassuming hillside location. We returned to the house to enjoy my first picnic of the season as the weather was so warm and Nick had a huge pot of homemade vegetable soup and stories waiting for us, including the infamous tale of the black bath . But that is a story for another time. This is what I love best about the Chilterns it that you set off thinking you will be doing one thing when in fact something quite different and delightful comes along. It’s such a cliche I know, but Pigotts really is a hidden gem, and my walks in the woods made more enjoyable as I test out my new-found wood-lore! There are many paths through Pigotts Wood, and you can look out for the crucifix that Eric Gill designed which was carved by Donald Potter. It was nailed to a small beech tree in the Wood which Gill owned. He is said to have taken his daily constitutional to the Crucifix Tree where he read his rosary. Was that redemption he was seeking?